Modes are a Blender-level object-oriented feature, which means that whole Blender application is always in a singular mode, and that the available modes vary depending on the selected active object’s type – most of them only enable the default Object Mode (like cameras, lamps, etc.). Each mode is designed to edit an aspect of the selected object. See Tab. Blender’s Modes below for details. You set the current mode in the Mode selector of 3D View header (see Fig. The Mode select menu.). 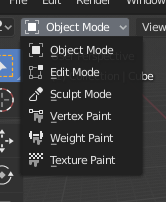 You can only select objects in Object Mode. In all others, the current object selection is „locked“ (except, to some extent, with an armature’s Pose Mode). They can modify the panels and/or controls available in some Properties editor tabs. They can modify the behavior of the whole editor, like e.g. the UV/Image Editor and 3D View. The default mode, available for all object types, as it is dedicated to Object data-block editing (e.g. position, rotation, size). A mode available for all renderable object types, as it is dedicated to their „shape“ Object Data data-block editing (e.g. vertices/edges/faces for meshes, control points for curves/surfaces, etc.). A mesh-only mode, that enables Blender’s mesh 3D-sculpting tool. A mesh-only mode, that allows you to set your mesh’s vertices colors (i.e. to „paint“ them). A mesh-only mode, dedicated to vertex group weighting. A mesh-only mode, that allows you to paint your mesh’s texture directly on the model, in the 3D Views. A mesh-only mode, dedicated to particle systems, useful with editable systems (hair). An armature only mode, dedicated to armature posing. A Grease Pencil only mode, dedicated to editing Grease Pencil strokes. As you can see, using shortcuts to switch between modes can become quite tricky, especially with meshes. The cursor becomes a brush in Paint and Sculpt Modes. We will not go into any more detail on mode usages here, because most of them are tackled in their specific section. If you are reading this manual and some button or menu option is referenced that does not appear on your screen, it may be that you are not in the proper mode for that option to be valid.